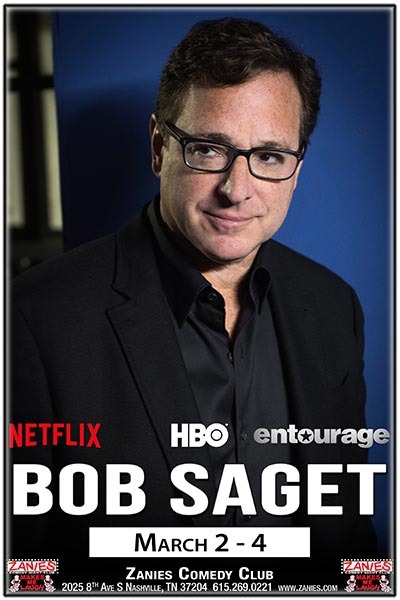 Yes, Bob Saget has starred in many successful television shows, including two of the most family-friendly shows network TV has ever produced ("Full House" and "Americas Funniest Home Videos") but he’s also an out of his mind, Grammy-nominated standup comedian for over thirty years. From his HBO special "That Ain't Right" to his scene-stealing cameos in "Entourage," and "The Aristocrats," it’s always effective as Saget embraces his dark side. Bob directed MGM’s cult favorite feature film "Dirty Work," the ABC television movie, "For Hope," and the hugely successful DVD release of "Farce of the Penguins," which he voiced-over, wrote, directed, and produced, with producer David Permut. "The Comedy Central Roast of Bob Saget" premiered to the second highest ratings of all TV that night, second only to the Olympics. Bob was seen several times reprising the role of “Himself” on HBO’s hit series “Entourage” as well as a cameo in the film. His 2013 one-hour stand-up special, That’s What I’m Talkin’ About, was nominated for a 2014 Grammy Award for Best Comedy Album and is now available as a CD, DVD and download. Bob’s first book is a New York Times Best Seller - DIRTY DADDY: The Chronicles of a Family Man Turned Filthy Comedian was released on April 8, 2014 to critical acclaim with Vanity Fair calling it, “Hilarious and at times heartbreaking.” The book is also available as an audio book, recorded by Bob himself. In January 2016, Bob finished a very fulfilling and successful 9-week run on Broadway in the Tony-nominated play, Hand To God, playing the part of a Lutheran minister, Pastor Greg. That year he was also seen in the first and second seasons of the hit Netflix series, Fuller House. Season 3 of Fuller House premiered in 2017 and Season 4 premiered in 2018. Bob will shoot the fifth and final season of Fuller House later this year. For many years now, Bob has been a proud board member of the Scleroderma Research Foundation. He co-produces and hosts "Cool Comedy Hot Cuisine" fundraising events in Los Angeles, New York, Las Vegas and San Francisco. To date, they have raised over 48 million dollars for the SRF. Bob’s new hour-long stand-up special, Zero To Sixty, premiered worldwide on November 14, 2017 on multiple digital platforms including Amazon Prime, iTunes, Comcast, AT&T, Charter, DirecTV, Dish, Google Play and many others. It's available in movie form as well as a comedy album including vinyl LPs as well as streaming and downloads for all forms. Bob is directing a documentary about legendary comedian, actor, writer and above all, artist, Martin Mull, produced by Kevin Bright. April 23, 2019 will see the release of the independent film, Benjamin, which Bob directed and will star in with an amazing ensemble cast: Rob Corddry, Mary Lynn Rajskub, Kevin Pollak, Cheri Oteri, Dave Foley, Max Burkholder, Clara Mamet, David Hull, Jonny Weston, and Peri Gilpin. The film was written by Joshua Turek and produced by Nicholas Tabarrok. In this original dark comedy, Ed (Bob Saget), reluctantly calls together an oddball assortment of friends and family to intervene on the supposed drug habit of his 15-year-old son, Benjamin (Max Burkholder). What quickly follows is a night of finger-pointing, petty thievery, adulterous backstabbing, and a seesaw of crooked emotional revelations — all leading to the misguided but sincere attempt to heal this dysfunctional family. Bob will host, write and Executive Produce the new ABC series, Videos After Dark, featuring home videos with an edgier twist. The show premiered an hour-long first look on March 12 with the full season premiering later this year. Bob made his London performance debut on September 21, 2018 at The Leicester Square Theatre and he continues performing standup throughout North America.